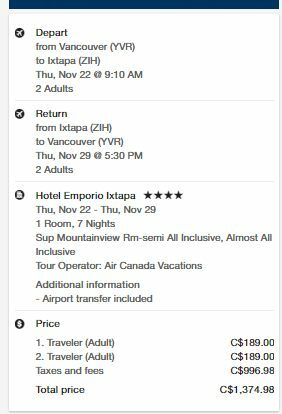 Air Canada Vacations has dropped the price of a 1 week all inclusive package (hotel, meals, drinks, transfers) from Vancouver to the Emporio Ixtapa in Ixtapa, Mexico down to $688 CAD (per person) including taxes. 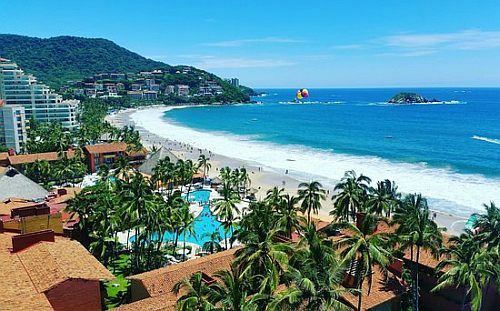 The Emporio Ixtapa has 4 circles on TripAdvisor with 54% of reviews rating it as Excellent. Most places rate it as a 4*. 4. Click on the 'Select' button to select the Emporio Ixtapa. IMPORTANT: On the next page, you need to be sure to select the 'Almost All Inclusive' plan.